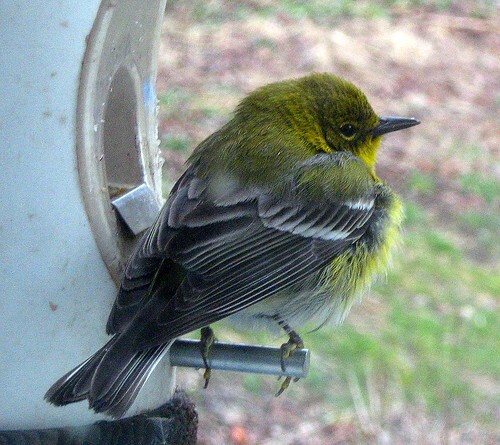 pine warbler at the feeder, originally uploaded by jahansell. This guy is so cute - if spring would ever come to Connecticut he could find something else to eat besides birdseed! I know it's a bit grainy - shot on lo-res, cloudy evening, through a window etc. - but I wanted to share it anyway! If you haven't read the post from yesterday, please scroll down! Low res but it still looks super Jenny. I like it a great deal! It looks like an American Gold Finch. A male. I might be wrong but that is what he looks like. Nice photo. Have you tried one of those finch socks (seed inside a woven net in white). They can be filled and the birds (gold finches house finches and purple finches) all feed from them. Abe, if you google both the goldfinch and the pine warbler (google images) you'll quickly see the obvious difference - bill shape. This guy has a classic warbler bill - narrow, meant for insects. Finch bills are more of a broad triangle - meant for cracking seeds. (The Pine is the only warbler who comes to feeders - most warblers never eat seeds.) That said, I made the same mistake at first - it was my husband who id'd it - he's the expert, not me! ps. happy to hear you'd be getting Nikon D70 despite the circumstance. Best of luck on your triatholon! Oh yes, you are right. I never really looked at the bill or beak the other time I was here. I did think the colors were a little towards the greenish yellow and not the vivid yellows on our gold finiches but thought that might be the camera. Thanks for coming to my blog and pointing out my mistake. What a lovely bird. I love its colouring. there really should be a competition or a collaboration because I am really liking all the photos from you and Abraham Lincoln - you guys are the bestest - nice to see nature photos!